Netball Scotland’s new Club Accreditation Scheme, The Thistle Mark has been created to support and empower our clubs to strive to be the best they can be. There are three levels of the Scheme open to clubs, by clicking on the links below you can find out more details of each level, including the criteria, rewards and application process for each respective level. Our introductory level benefits include an official certificate of recognition and recognition on the Netball Scotland- Official Accredited Clubs section of our website. The Bronze Level Application is a simple online application form. To submit a Bronze Level Application – Click Here. The criteria is set out under the four main pillars, as referred to in Netball Scotland’s 2015-2019 Strategic Plan, Polaris. · Supply the name of and contact details for the main club contact or session facilitator. This should be correct & current for the season the club accreditation application is submitted. · Affiliate members to Netball Scotland. · Demonstrate that the club is committed to enforcing equality under Netball Scotland’s recommended guidelines. – If the club has a junior section, demonstrate that all the individuals who work with any junior members have a certified PVG through that club. · Have a social media and/or online club presence that is easily accessible for new and current members. · Demonstrate that the club encourages players of all levels of experience and ability to get involved in the game. · Demonstrate that the club supports the development of club members with their personal development aims. This can range from players to coaches, umpires and volunteers. · Demonstrate that the club has a session(s) that caters for specific target groups, e.g. Junior, Senior, BBN sessions, etc. · A Netball Scotland accreditation certificate. · Information on level of accreditation given when signposting new members and published on the Netball Scotland website. · Exclusive use of the Netball Scotland Thistle Mark Logo for club marketing. · Netball Scotland staff support to develop the club’s ability to achieve higher accreditation levels. 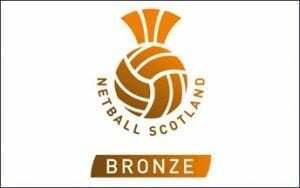 In addition to the Bronze benefits, gaining a silver award will entitle your club to £50 credit towards a Netball Scotland Education course and 10% discount on entry into any Netball Scotland National Competitions and many more. 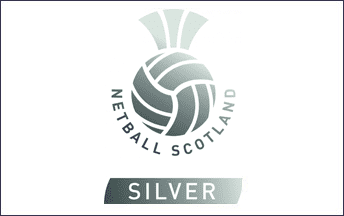 The Silver Level Application Pack is provided on a Netball Scotland USB Drive, to express your interest in completing this application you will be required to complete an online application request form. Before completing a Silver application we recommend that you read through the Club Application Guidelines for this level to ensure you aware of the set criteria and information you will need to provide in order to complete the application. To download the Club Guidelines to support you in completing your application – Click Here. To submit an request for a Silver Level Application Pack – Click Here. The criteria is set out under the four main pillars, as referred to in Netball Scotland’s 2015-19 Strategic Plan, Polaris. · Affiliate all club members to Netball Scotland. · Have a club committee in place and positions filled. · Have a club constitution or working club guidelines. · Hold a club/treasurers bank account with 2 x signatories. · Hold and record minutes of committee meetings. · Have written and signed Role Descriptions for committee members to adhere to and ensure they are provided with an appropriate handover for their role. · Have all the following club policies, procedures and documents in place. – Code of Conduct for players and coaches. · Hold and record Minutes of Annual General Meetings. · Have regular communication with club members. · Welcome all new members into the club equally. · Have a club identity. · Demonstrate that the club encourages players of all levels of experience and ability to be involved in the game. · Demonstrate your involvement with current competition opportunities. · Encourage appropriate player development by nominating players for trials for Netball Scotland development, representative and national squads. – 1 x UKCC Level 1 coach per senior competitive team. – 1 x UKCC Level 2 coach per Club. – 1 x C-Umpire per senior competitive team. – The only exception to this requirement is for affiliated Junior only Clubs who require the minimum of 1 x UKCC Level 2 per club and 1 x C-Umpire per team. · Demonstrate that the club recognises all club volunteers & members. · Demonstrate that the club committee gives club members the opportunity to input into the running of the club. · Netball Scotland staff support to develop the club’s ability to achieve higher accreditation levels and a club development plan. · Early bird access to all ticketed events. Our Gold level Thistle Mark shows that a Club has met the highest standards of governance, whilst also demonstrating an ongoing commitment to the development of a Club environment which supports and encourages it’s people to achieve the highest standards of playing, coaching, officiating, umpiring and volunteering. The Gold Level Application Pack is provided on a Netball Scotland USB Drive, to express your interest in completing this application you will be required to complete an online application request form. Before completing a Gold application we recommend that you read through the Club Application Guidelines for this level to ensure you aware of the set criteria and information you will need to provide in order to complete the application. To download the Club Guidelines to support you in completing your application – Click Here. To submit an request for a Gold Level Application Pack – Click Here. · Supply the name and contact details for the main club contact or session facilitator. This should be correct & current for the season the club accreditation application is submitted. · Hold and record committee meetings. – Code of Conduct for players, coaches and parents. · Have a current club strategy or action plan. · Demonstrate that the club has developed community engagement. · Demonstrate that the club has a session(s) that caters for more than one specific target group(s) via a player pathway. – 1 x UKCC Level 2 coach per senior competitive team. – 1 x B-Umpire per senior competitive team. – The only exception to this requirement is for affiliated Junior only clubs who require the minimum of 1 x UKCC Level 2 per club and 1 x UKCC Level 1 per junior team, and 1 C-Umpire per team. · Support and implement a coaching programme or structure within the club. · Support an officiating and/or coaching mentor programme. For further information or support on The Thistle Mark Accreditation do not hesitate to get in touch with your local Regional Development Manager or contact the Netball Scotland Office on clubs@netballscotland.com or telephone 0141 428 3464. The Thistle Mark will be submitted by clubs and granted by Netball Scotland in tri-annual cycles. Silver & Gold Online Application Request Form. Following completion of the application the USB (containing your application form and evidence) must be returned to Netball Scotland for submission and marking within the cycle deadline. There are 3 submission deadlines in each season and clubs must complete the appropriate application process prior to/on these dates in order to be considered for accreditation within that cycle. · Applications will be processed by Netball Scotland RDMs or the wider Development Team. A feedback form will be completed, detailing where a club has met or not yet met the criteria and will provide feedback or action points as appropriate. · If a club is successful with their accreditation application they will be informed by Netball Scotland, within 14 days of the submission deadline date of their success and the rewards for achieving this level of accreditation will be arranged. · If a club is unsuccessful, they should use the feedback form detailing where criteria has not yet been met and where the club should consider as areas for development to help them progress towards a successful accreditation in the future. · If a club is not successful they will be eligible to re-apply for the accreditation prior to/on the next submission date. However, they do not need to repeat the complete application process again. The club’s re-application can be reviewed by way of a meeting with their respective RDM or the CCDM. The club must demonstrate how they have met the action points and can now meet the required criteria. A Netball Scotland Thistle Mark Accreditation will be valid for 2 years from the point of being granted. Following this 2 year period clubs will be required to complete the accreditation process again, although at any point with in this period they will be eligible to apply for a higher level application. For further information or support on The Thistle Mark Accreditation do not hesitate to get in touch with your local Regional Development Manager (contacts here) or contact the Netball Scotland Office on clubs@netballscotland.com or telephone 0141 428 3464.